The world's leading tech companies are currently investing billions of dollars in Artificial Intelligence. In China, the first robotic dentist has already completed its first surgery, and in the next 20 years, 47 pct. of jobs are estimated to be at risk of being automated. In 2020, 43 pct. of US workers are estimated to work as freelancers and 82 pct. of today's youth have already used YouTube as learning platform. In a future where technology is an integrated part of work – what will be the implications for people, organizations and society? Innovation Centre Denmark invites you to apply for the Future of Work Masterclass, a one-week intensive learning experience in Silicon Valley in June of 2019. In collaboration with the world's leading tech companies and research institutions, we will explore the opportunities and challenges of new technologies on the future of work. The class will give you a deeper insight into the newest technologies shaping our future such as AI, robotics, blockchain, and VR/AR. You will be challenged on how the future workplace will look like, and together with like-minded leaders discuss what implication this will have on people and organizations. You will leave Silicon Valley with a new understanding of the discussions you need to have in your organization to be prepared for the future. The class will be thought-provoking and reflective with focus on active learning, hands-on application and experimentation. It will involve discussions and networking with Danish peers and leading American technology pioneers. We are already talking to Google, Facebook, LinkedIn, YouTube, Stanford, Berkeley, Udacity and Institute of the Future. What are the emerging technologies that will have an impact on the future of work? What are the leading tech companies of Silicon Valley working on? What does it all mean behind the buzzwords, and what are the implications to your organization? How will new technologies change how people think and behave in the future? What employee skills and tools will be valued? What are the employees of the future expecting from their workplace? How will different generations react and adapt to technology changes? What are the new challenges for businesses and leaders in the future of work? How can organizations better use new technologies to develop their business? What are the responsibility of organizations and society in a future where technology knowledge-levels differs across generations? The Master Class will be take place in Silicon Valley between June 3rd and June 7th 2019. 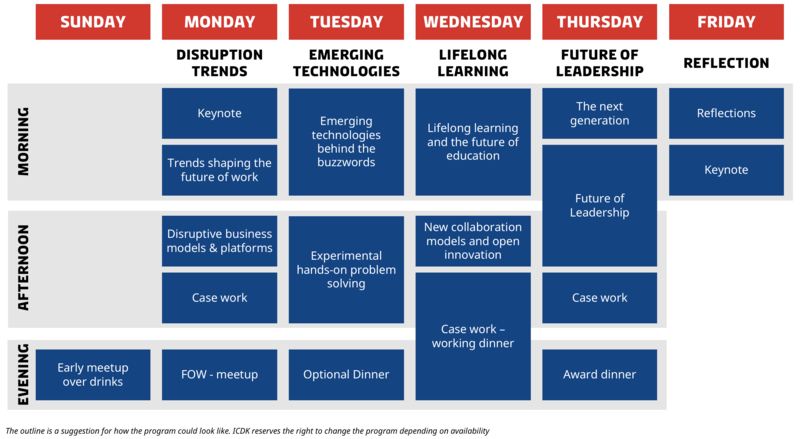 Each day will focus on different themes of the future of work, with a mix of keynotes, engaging discussions, collaborative case work and experimentation. Names of speakers will be announced countinously here and on our social media. The speakers for this year's Master Class will be announced shortly. 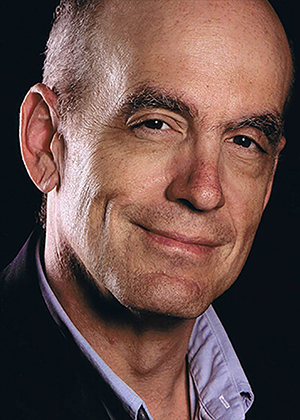 Gary A. Bolles is an internationally-recognized expert on the future of work and the future of learning. As Chair for the Future of Work for Singularity University, he leads the organization’s efforts to empower a global community with the mindset, skillset, and network to create an abundant future of work and learning. In the seismic transition to what Bolles calls the digital work economy, individuals, organizations, communities, and countries all need to develop a shared understanding of the dynamics of disruptive change, collaborate on the development of effective strategies, and ensure that all people have access to meaningful work and lifelong learning opportunities. 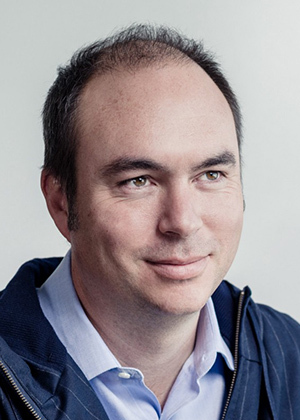 Chris Farinacci is head of business at Asana, leading the company's business growth and go-to-market efforts, including sales, marketing, business development and customer operations. Before joining Asana, Chris led global marketing for Google’s enterprise and education businesses, responsible for helping scale it to a multi-billion-dollar business. 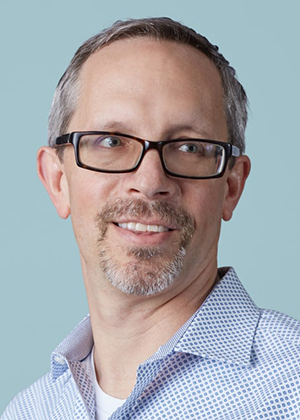 Prior to Google, he’s had diverse leadership experiences in the enterprise software industry including CMO of Hara, VP of Application Marketing at Oracle and Senior Vice President of Global Marketing at Agile Software. Chris holds a B.S. in Mechanical Engineering from The Ohio State University. 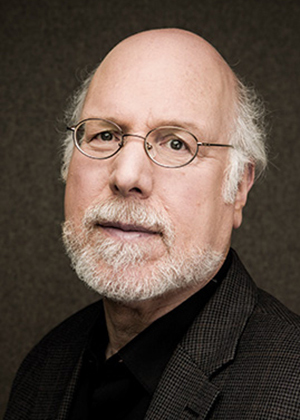 Stephen M. Kosslyn is the Founder, President and CEO of Foundry College. Prior to that, he was Founding Dean and Chief Academic Officer of the Minerva Schools at the Keck Graduate Institute. He previously served as Director of the Center for Advanced Study in the Behavioral Sciences at Stanford University after having been chair of the Department of Psychology, Dean of Social Science, and the John Lindsley Professor of Psychology at Harvard University. Kosslyn's research has focused on the nature of visual cognition, visual communication, and the science of learning; he has authored or co-authored 14 books and over 300 articles on these topics. Stephane Kasriel is in a unique position to share his perspective on future trends — from global forces impacting the job market and the rise of the freelance economy to how companies are changing the way they build teams and the way education should evolve. He holds an MBA from INSEAD, a Master’s from Stanford in Computer Science and a BS from Ecole Polytechnique in France. Harvard Business Review and Bloomberg View have featured him on topics including the future of work, entrepreneurship, and how to strengthen our global economy. 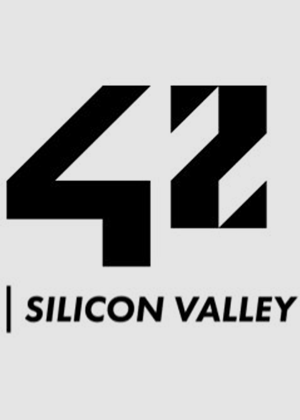 42 Silicon Valley is an innovative engineering college in the San Francisco Bay Area. As the leading college for software engineering, coding, and programming, we're disrupting engineering education and tech talent pipelines in the Bay. NO TEACHERS – Knowledge these days is no longer solely transmitted in the classical teacher/student fashion. At 42, there are no teachers, instead students have to learn themselves, be resourceful, and figure out how to learn. NO COURSES. NO CLASSES – Learning at 42 Silicon Valley isn’t restricted by time periods. Students have freedom to explore topics, and while there aren’t traditional exams, students are graded by their peers. 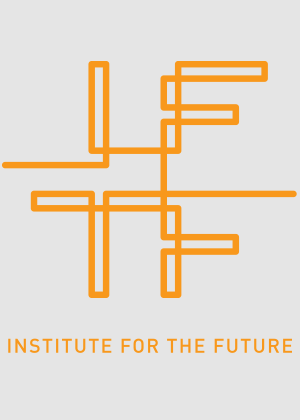 The core of IFTF's work is identifying emerging discontinuities that will transform global society and the global marketplace. They provide organizations with insights into business strategy, design process, innovation, and social dilemmas. Their research spans a broad territory of deeply transformative trends, from health and health care to technology, the workplace, and human identity. The Master Class takes place in Silicon Valley between June 3rd and June 7th 2019. Price for attending the class is DKK 19 900 per participant (excludes flights, travel and accommodation). The Master Class will hold a maximum of 30 people. If you are interested in participating in the Master Class, and want to know more, please click the link below and find find more information. Innovation Centre Denmark (ICDK) is a partnership between the Ministry of Higher Education and Science and the Ministry of Foreign Affairs of Denmark. We help Danish companies and research institutions in accessing foreign knowledge, network, technologies, capital and markets. Innovation Centre Denmark will use the information you provide on this form to provide updates around the Master Class. You can revoke your accept at any time by contacting svicdk@um.dk. For information about our privacy practices, please visit our website. We use MailChimp as our communication platform. By clicking below to apply, you acknowledge that your information will be transferred to MailChimp for processing. Learn more about MailChimp's privacy practices here.